This short piece of fiction I wrote has a few references to Latin America so I thought I would publish it here. I have been doing quite a lot of translation recently but primarily from Spanish to English, so I decided I would translate this to Spanish. 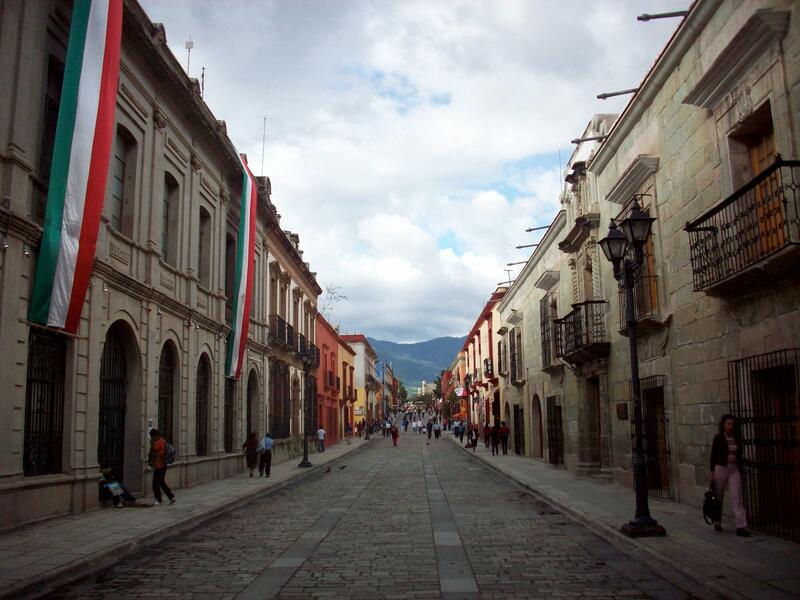 The photo is of Oaxaca, a beautiful colonial city in the south of Mexico, where you will find beautiful squares, chapulínes (dried edible grasshoppers) by the basketful and Zapotec grandmothers. I dreamt I was in a town square. The square was bare except for pigeons. In the dream I dreamt I was asleep, having a nightmare. Me smaller inside, dependent on the whims of others to be released. What awoke me was a mother green pigeon pecking at my nose. The pigeon fluttered away and I drifted off to sleep again. I hadn’t slept for days. It was a sleep inside a sleep, a nap within a kip, a siesta inside a jar. with a perforated lid to allow in some air. But the holes were wide enough to add chilli powder and salt too. teeth of a Zapotec grandmother. yet another green pigeon woke me, this time by laying an egg on my face. I cracked it open and out came a kind of Russian doll. I opened it and inside there was a miniature me. I was jaundiced with just a hint of green in my complexion. mixed into one viscous accumulation. It’s currently being analysed in a government laboratory. Soñe que estuve en una plaza de un pueblo. En el sueño soñe que estaba dormido, teniendo una pesadilla. Yo estaría más pequeño por dentro, dependiente a los antojos de otros para ser liberado. Lo qué me despertó fue una paloma verde mamá, picoteando mi nariz. La paloma se fue aleteando y yo volvi a la deriva del sueño. No había dormido durante días. Fue un sueño dentro de un sueño, una cabezada en una siesta, una siesta dentro de un frasco. afortunadamente con una tapa perforada para permitir entrar aire. Pero los hoyos eran suficientemente anchos para agregar chile y sal también. En mi sueño me desequé y entonces me machacó una abuela zapoteca entre sus dientes afilados. Otra paloma me despertó, esta vez, con poner un huevo en mi cara. Lo casqué y salió un tipo de muñeca rusa. La abri y por dentro me encontré, en miniatura. Estaba ictérico con también un rastro de verde en mi tez. mezclado en una acumulación viscosa. Actualmente la están analizando en un laboratorio del gobierno. Cheers Bill! Thanks for reading. 51,244 page visits. Please come again.